We had Vietnamese chicken curry earlier this week, so I used the leftovers to make this delicious chicken and tofu dish (mì xào cà ri gà). I have an aversion to wasting food, but that doesn't mean that the second life you breathe into a dish has to be any less wonderful than the original creation. I shredded the chicken from the curry dish and made a stir-fry adding cubed tofu and vegetables available this season. To complete the meal, I added egg noodles. The dish couldn't be simpler to make, and it will work whether you have meat, poultry or seafood. 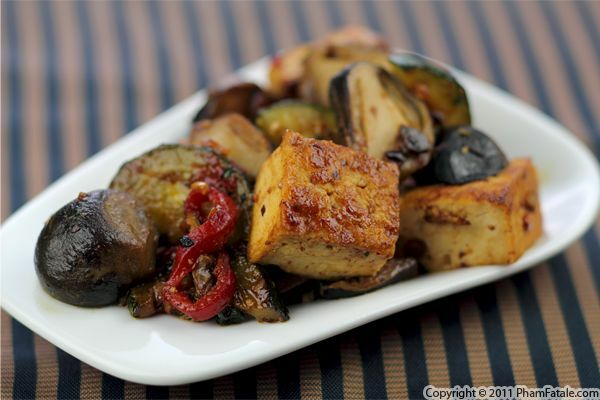 Japanese eggplants cook fairly quickly and this stir fry sauce consists of basic ingredients such as soy sauce, chile black bean sauce, palm sugar and fresh ginger. 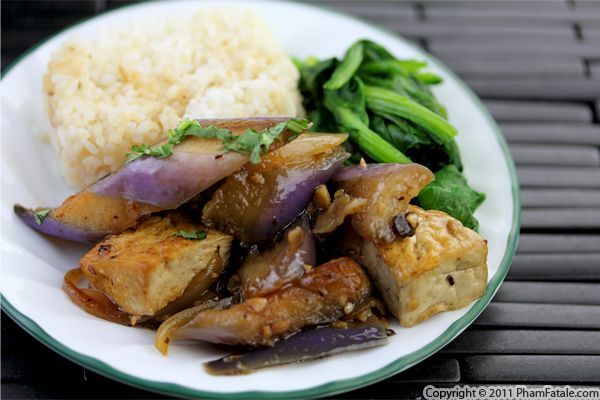 The ginger and black bean sauce enhances the bland eggplant and tofu. All that's left is to steam a few leafy greens and have jasmine rice ready in the rice cooker. It's as easy as 1-2-3! I barely have time for anything these days, and when I have very little time to cook, my go-to dish is a tofu stir fry. It’s nutritious and it allows me to make use of whatever I have on hand. 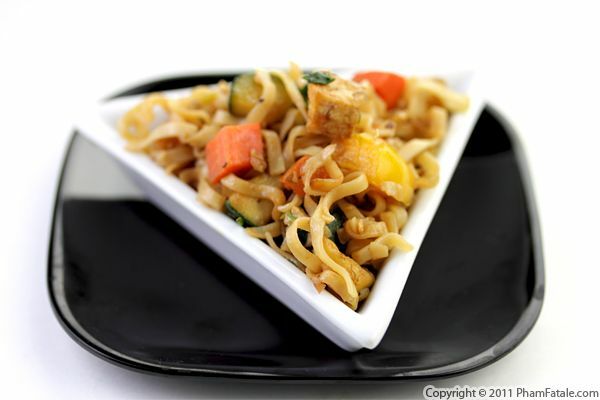 Learn the basics and you’ll be able to dazzle your family with creative stir fry dishes. Lemongrass is a wonderfully fragrant herb. 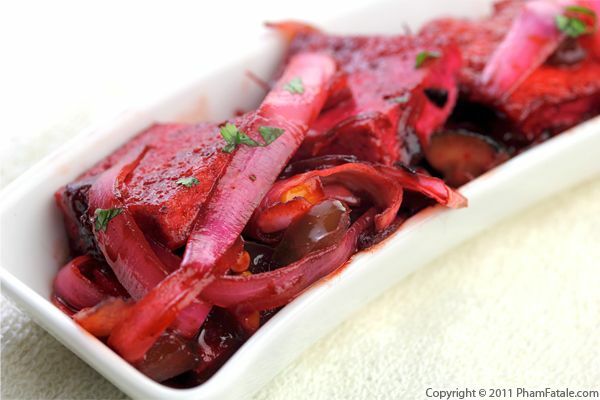 If prepped and cooked properly, it adds not only flavor but also a great texture to vegetables, meat, fish or tofu. 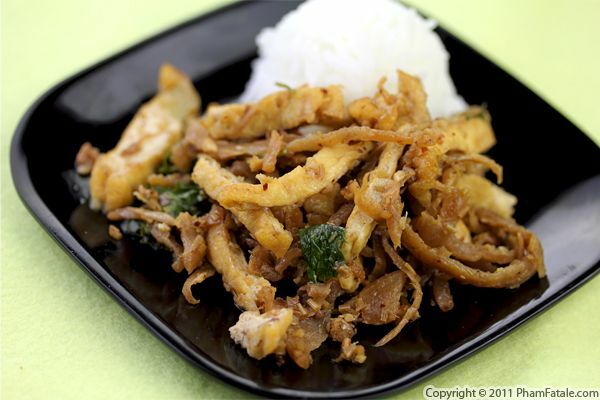 I used the lemongrass in this dish as a coating for the tofu (tàu hũ xào xả). Daikon radish (củ cải trắng in Vietnamese) provides contrasts in both texture and flavor. I think the way the daikon is cut dramatically changes the texture of the dish. By cutting it into thick strings, the daikon cooks fast but remain slightly firm. Catering to a large crowd of vegetarians in my house, I often find myself cooking a lot of lentils (or any legumes) and tofu dishes. I realized I haven't cooked any tofu in quite some time, so I made my quick and easy tofu stir fry this evening. I sautéed a bunch of vegetables (Brussels sprouts, straw mushrooms, zucchini and red bell peppers) that I had on hand and mixed them with the tofu. My husband loves this dish and says he could eat the same thing every day. I usually serve it with brown rice and a bowl of canh (Vietnamese broth). It's a complete, flavorful meal, plus it's healthy! What else could you ask for? Page 13 of 23 pages.